BBC Radio 4 - From Our Own Correspondent, What's in a Name? Memories of Turkey's attempted coup a month ago and a view of its mood today, Canada's First Nations, youth aspirations in Senegal, and a row over burkinis on Corsica's beaches. 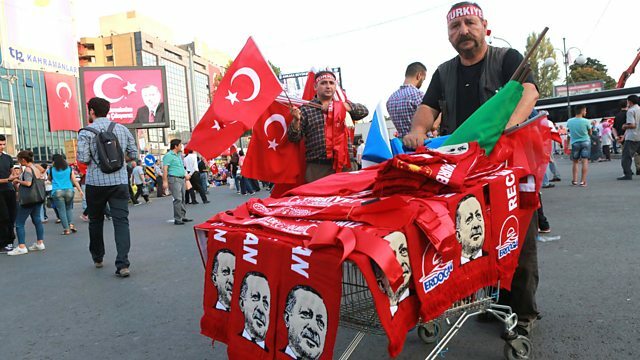 Mark Lowen gauges the mood in Turkey today - and detects a hardening of public opinion against anyone thought to be associated with the attempted coup in July as well as an anti-Western backlash. Seref Isler was part of the BBC team covering those events and recalls what it was like to witness "the night no-one slept". Stephen Sackur's been to Attawapiskat and Calgary to hear of the very modern challenges threatening the survival of Canada's historic First Nation people: can the new Canadian Prime Minister's promises to help these communities be kept? In a Dakar nightclub, Nicola Kelly meets some aspiring DJs and hears their ideas on how to keep Senegalese young people from risking their lives on risky emigrant routes. And Martin Buckley is on the beaches of Corsica to learn why this island - along with the rest of France - has been convulsed with concern over the burkini, even though nobody seems yet to have worn the garment in public there.